When a movie’s tag lines includes “love demands everything” and “let love lie”, you’ve been warned. While those words declare the film a love story, they are also code for “bring tissues”. When that movie stars three Oscar nominees, the idea is it will be worth it. 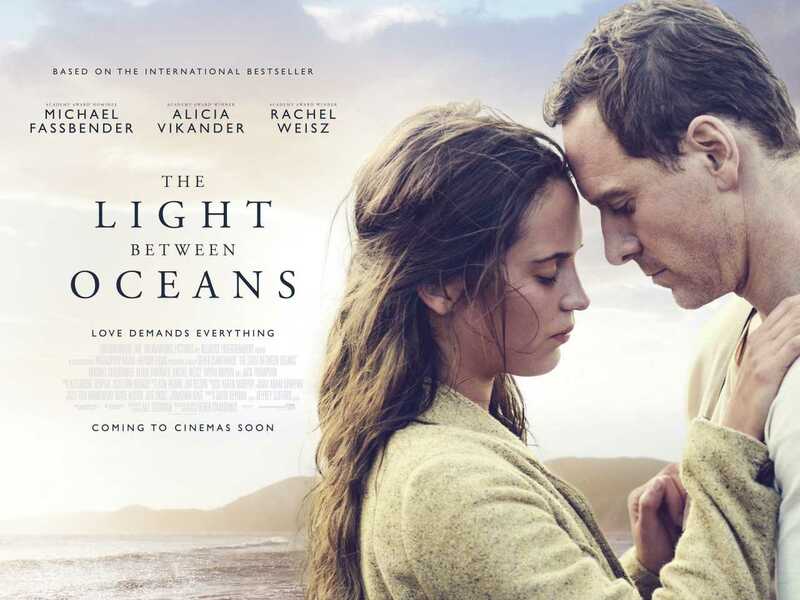 THE LIGHT BETWEEN OCEANS, based on the bestselling novel by M. L. Stedman, hopes to start the awards consideration a bit early and act as counter-programming for the glut of summer superhero and comedy flicks in theaters. It is written for the screen and directed by Derek Cianfrance, who helmed acclaimed Indie bummer BLUE VALENTINE and studio bummer THE PLACE BEYOND THE PINES, so he knows a thing or two about bleakness on film. Alicia Vikander, Michael Fassbender, and Rachel Weisz are three actors also known for fearlessly approaching dark subject matter. Do they bring enough thespian star power to attract “serious” film fans in the last dog-days of summer? It’s 1918. Shellshocked WWI soldier Tom Shelbourne (Fassbender) takes on the solitary job of lighthouse caretaker off the coast of Australian, and for months sits alone weeping from his memories of battle. Into this darkness a light is introduced in the form of Isabel (Vikander), a local girl who seems to seek new joy, despite mourning the loss of her two brothers. They fall in love and marry. At this point in the film, the audience can enjoy a brief respite between heartbreaks, a sort of light between two oceans of tears. All too quickly we are submerged is sadness again, when Isabel unsuccessfully tries to bear children. When a small boat carrying a dead man and a baby drifts within reach of the lighthouse, they decide to keep the little girl as their own. Tom wants to report it, but when Isabel asks “Can we just leave it a while?”, we know no ultimate good can come of where they’re headed…Sure enough, after a few years of guarded joy for the makeshift family, everything goes to pieces. Weisz plays Hanna Roennfeldt, the woman who can put an end to their happy family life. Sadness and sacrifice, regret and recriminations, and copious tears shed with alarming frequency ensue. While there’s repeated heartbreak, THE LIGHT BETWEEN OCEANS is not as tortuous as you might imagine… All the characters are driven by loss and loneliness and love. Though at its heart the story is simple, the characters, and their motivations are complicated. As such, it is imperative that many of the morally ambiguous choices the audience watches these people make be, if not justifiable, certainly understandable. We don’t, however, get to see Isabel’s suffering or mental deterioration enough to really get why Tom makes the decisions he does later in the story. Without imposing our own perceptions of her suffering, the way she is represented might make Isabel seem less fragile and more self-absorbed. Indeed a number of the choices these characters make seem questionable, in the way viewers might shout at the screen for them to pull themselves together and for god’s sake make better choices! It’s hard for a story with this level of predictability not to devolve into a sort of movie-of-the-week. If, regardless of the gorgeous, naturalistic backdrop of sea and sky, it becomes less like Oscar bait and more like a B-list BBC miniseries with an A-list cast, it is through no fault of the actors. Fassbender portrays Tom Shelbourne the same way he does many of his roles. It seems he subscribes to the Ingrid Bergman school of acting. She famously told her daughter Isabella Rossellini to “keep it simple. Make a blank face, and the music and the story will fill it in.” Up to this point in his career, his stillness and simplicity have worked as choices, so perhaps Bergman is right. Thank goodness for the chemistry between the two stars. Vikander Fassbender are beautiful together. Also, she and Weisz are both authentic and believable. They raise the material beyond what it might deserve, as do perennial Australian film favorites Brian Brown and Jack Thompson, who co-star. As romantic tragedies go, THE LIGHT BETWEEN OCEANS fits the bill pretty well, if one is looking for such a thing, and is greatly benefitted by the actors and landscape. Certainly the visual reference to Heathcliff of WUTHERING HEIGHTS is intentional, as exampled by a scowling Fassbender climbing hundreds of stairs to the lighthouse, the wind whipping his long-tailed overcoat up around him. Swoon? Perhaps. But it’s too hot for swooning without a really good reason right now.